I’ve yet to find a “healthy” peanut butter cup that tastes as good as the Reese’s original, but that didn’t stop me from concocting a protein shake version of my favorite candy! I knew chocolate almond milk and chocolate chips (yes, I let myself use the real deal for this one although you can use carob chips too) were a no-brainer, as was of course peanut butter. The surprise (that ended up becoming my favorite ingredient!) in this one was the avocado. I’ve used avocados in my smoothies before and enjoy the creaminess they add so it added just the right consistency that to me, was reminiscent of when you bite into the soft center of a Reese’s. I stuck to my old standby of pea protein but you could also use any type of chocolate protein powder if you want to intensify the flavor. Same thing with the liquid stevia, SweetLeaf makes a chocolate flavored liquid stevia that you can use instead of plain stevia if you want it to taste more chocolaty. 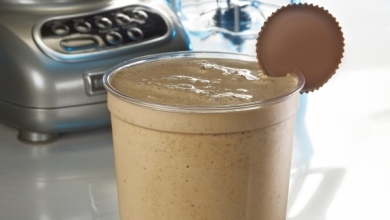 Of course, you could always ‘go crazy’ and dump a few Reeeses Peanut Butter Cups into your blender, add some milk and protein powder and blend away. That would definitely be mighty tasty. It would also negate pretty much any workout that you did in the past week. We all need to splurge every now and then, but my goal with this recipe was to find a creative way to get as close as possible to a peanut butter cup protein shake without having to use the real thing. Keeping it clean will still being tasty is the key to any diet or healthy protein shake. It might not be exactly a Reese’s PB cup but it’s still pretty darn yummy for breakfast or dessert! To make, simply ombine all ingredients in a blender and process until smooth.